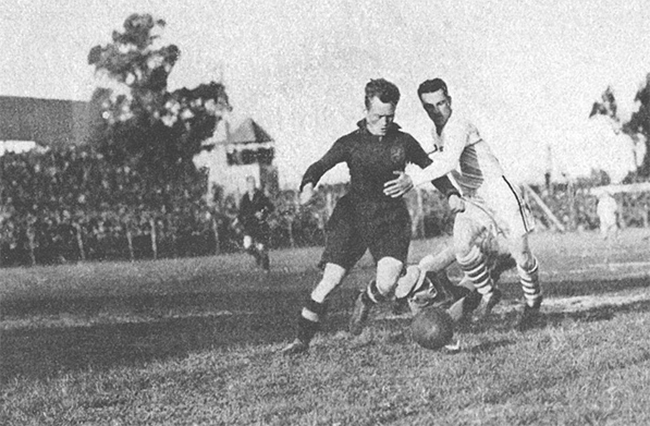 Bert Patenaude (in white) with the US at the 1930 World Cup. American soccer fans have gotten fairly used to second-leg drama in recent years, as two-leg, aggregate goals playoff series have become the rule on this side of the Atlantic. It’s easy to think that the most dramatic second-leg comeback in MLS history, one involving the San Jose Earthquakes and the Los Angeles Galaxy in 2003, is also the biggest in American soccer history. San Jose’s comeback that year was a legendary one, but surprisingly, it is not the deepest hole that an American pro soccer team has ever climbed out of in a aggregate-goals series. What happened in 2003 was pretty extreme. Los Angeles had won the first game of its two-leg quarterfinal series against San Jose by 2-0 in Los Angeles. The Galaxy then scored two more goals in the first 13 minutes of the second leg in San Jose for a seemingly unassailable 4-0 aggregate lead. Fans in San Jose have fond memories of what happened after that. Fans in Los Angeles would rather forget. With that comeback as a background, let’s go back to January 1932, and the series that decided the 1931 ASL championship. The series was played in 1932 because the regular season didn’t end until the final week of 1931. The season was split into spring and fall halves, with the two winners playing off for the title. The New York Giants won in the spring and the New Bedford Whalers in the fall. Their playoff meeting, like the one between Los Angeles and San Jose in 2003, was a two-game, total-goals series, and was played on Jan. 1 and Jan. 3. The first game, at Battery Park in New Bedford, Mass., was a bit one-sided. New Bedford was up by 2-0 at halftime on goals by Billy Gonsalves and Werner Nilsen. Nilsen made it 3-0 five minutes into the second half, but New York’s Bert Patenaude cut the margin to 3-1 three minutes later. After that it turned into a rout, with New Bedford scoring four goals in the next 10 minutes, three by Tom Florie and one by Gonsalves. An own-goal by New York’s Hugh Lafferty raised the count to 8-1, but New York goals by Patenaude and Frank Tollan in the last seven minutes made the final score slightly less lopsided at 8-3. It’s not likely that many New York fans believed that those two late goals would make much difference in the final outcome, but 3,000 of them turned out anyway two days later in New York for the second leg and New Bedford’s expected coronation. In the 20th minute of the game, Shamus O’Brien scored for New York after a pass from Patenaude. Then Patenaude did the same three minutes later, heading home a long pass, and Bart McGhee got a third New York goal before halftime. It was a horse race again, with New Bedford’s aggregate lead cut to 8-6. Eight minutes into the second half, O’Brien pulled New York still closer with his second goal of the game. The Giants, who at one time had trailed by seven goals, were now only one goal down. Ten minutes after that, a goal by New York’s Jimmy Gallagher leveled the aggregate at 8-8. The goal that gave the title to the Giants was not a last-gasp thing, as Patenaude scored it in the 80th minute (his fourth goal in the two games). The Giants had to stop New Bedford for another 10 minutes before the title was theirs by a 9-8 margin. Neither MLS nor the NASL has ever come close to that sort of comeback, with San Jose’s in 2003 falling well short of New York’s in 1932. The NASL only used aggregate-goals playoffs in its earliest seasons. This was lucky for the New York Cosmos, who in 1978 won a playoff series in which they had lost the opening game by 9-2. By the way, that 1932 game in which the New York Giants came from way back to win a series in which 17 goals were scored was part of a doubleheader, preceded by a game between two New York amateur teams. The score of the first game was 0-0, of course.